[Plano, Texas] At the JPMorgan Chase shareholder meeting today, New Economy Project presented an analysis of Chase’s track record of harming New Yorkers and New York City neighborhoods. The group’s analysis highlighted a litany of discriminatory and abusive practices by the bank, from longstanding mortgage redlining to siphoning of sorely-needed funds from Chase’s lowest-income customers – ultimately driving people out of mainstream banking. 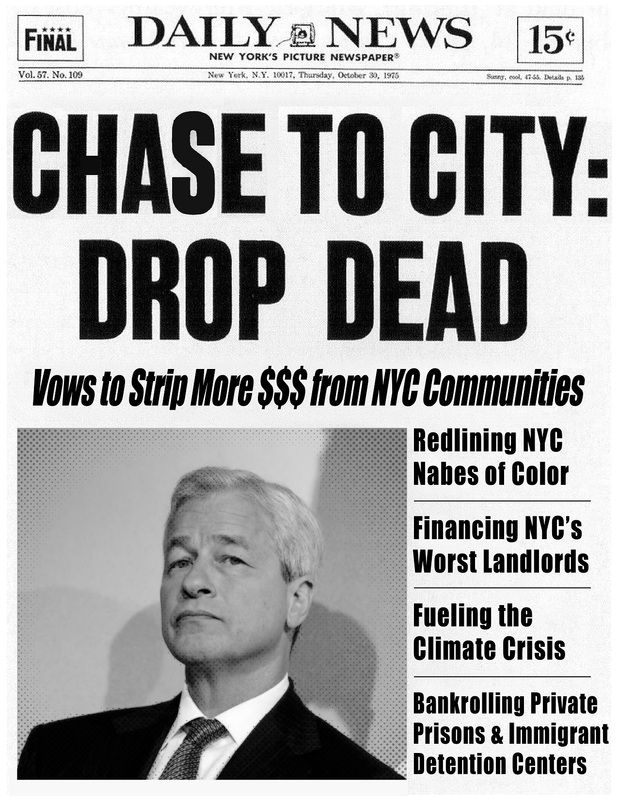 “The bank’s record of serving New Yorkers and New York City neighborhoods sends the clear message ‘Chase to City: Drop Dead’,” said Andy Morrison, campaigns director at New Economy Project, who spoke out at the shareholder meeting in Texas. Chase redlines low-income neighborhoods and neighborhoods of color. Even with the highest number of branches in NYC, Chase has left vast swaths of the city – particularly immigrant and low-income neighborhoods of color – with few or no branches. New Yorkers who live in predominantly white neighborhoods have access to almost three times as many Chase branches as New Yorkers in communities of color. Chase engages in discriminatory mortgage lending, with racial disparities at all income levels. Last year, Chase made mortgage loans to more than two-thirds of all white loan applicants. In contrast, Chase made mortgages to four out of ten black applicants, and just over half of all Latino applicants. Chase siphons money from low-income New Yorkers. Chase charged U.S. customers $1.86 billion in overdraft fees, in 2017. By definition, this usurious, controversial loan product targets the bank’s customers with the least financial resources, including low-wage workers, seniors on fixed incomes, and students. “We want to know how Chase plans to provide reparations for its systematic discrimination and siphoning of wealth from New York City communities,” said Juleon Robinson, program associate with New Economy Project, who also spoke out at the shareholder meeting. Click here to read our full comments to Mr. Dimon.